Many polishes do a fine job but eventually leave sticky wax buildup. Not this one: our product testers loved the way Bee's Wax polish brought a lustrous shine to all types of wood, without leaving an ugly residue. This natural formula will leave your home looking beautiful. Buy individually or buy in a pack and save! Note: This item ships via USPS when shipping to Alaska, Hawaii or Canada. Cannot be shipped via air (expedited). HMIS Ratings: Health 1, Flammability 1, Reactivity 1, Personal A. "I work at Lehman's and have taken orders for this product. After hearing a customer sing its praises, I decided to give it a try. I was shocked and amazed at what all you can use this on to restore luster to surfaces! I was stunned at how clean and streak-free it made my bathroom mirrors. It gives a nice sheen, but not super shiny--enough to make things look crisp. 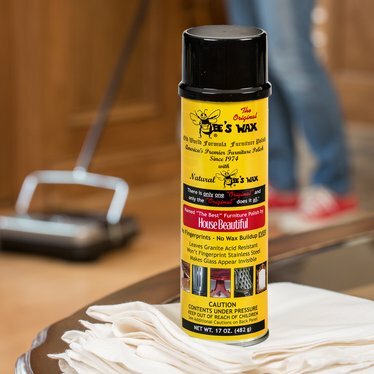 I strongly recommend this product to spiff-up the furniture and fixtures in your home!" Love this product! I now only use this one cleaner for all my needs. Smells great not too strong and it's the only cleaner I need! U was very skeptical that a clearer would work on wood and glass but this one's does! Buy a can it lasts forever and I'm a huge fan of all of Lehman's products...I've learned alot through their catalogs of better items to help improve the environment! I also think their non electric iron is pretty neat. I don't need knee but never realized one existed!! Fantastic company and fast shipping!!! I usually do not write reviews, but was prompted to write this while listening to my cleaning crew singing the praises of this product. It has made my granite feel so clean with no film. I can see that a mirror or appliance would resist fingerprints more readily, and I am at your website because I need to order more. BTW it does not offend my sensitive nose. It leaves a lemony, clean smell that dissipates within an hour. Someone used this stuff to "clean" a painted chair I have. I have the chair outside because of the SMELL of this spray. I tried washing the chair with a rag and dish detergent and the smell is still there. Smells like petro chemical.....that what it is. A must try polish. The best I have ever tried. Won't use anything else. My Windows never sparkled so much and best of all it seems to eliminate constant dusting. Everything glows. I use it on everything, granite, furniture, Windows, appliances. My stainless steel sink shines. Thank you for such a great product. First time user and i absolutely love love love it!!!! I have literally ran out of things to clean. Will definitely buy it again no need for other cleaners it takes the place of all your household cleaners. My quasi-antique furniture (50-75 years old) has never looked better, and the new furniture looks great too! And truly, no smearing or buildup. I even used it on my granite counters, and they look amazing! It smells nice, too. Will keep a constant supply on hand! I was using this to wax my wood furniture and happened to read on the label makes glass invisible. 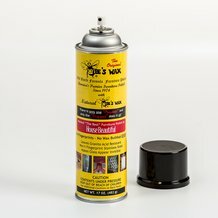 So I tried it for my windows with absolutely amazing results! My windows have never looked so good. I work at Lehman's and have taken orders for this product. After hearing a customer sing its praises, I decided to give it a try. I was shocked and amazed at what all you can use this on to restore luster to surfaces! I was stunned at how clean and streak-free it made my bathroom mirrors. It gives a nice sheen, but not super shiny--enough to make things look crisp. I strongly recommend this product to spiff-up the furniture and fixtures in your home! This stuff is what spray furniture polish should be! There hasn't been a real spray wax on the store shelves since the '70's. I have been looking for something like this for a while, and have finally found it! What a DIFFERENCE! I am now ordering more. Cleans and polishes very well. I also love the scent-so refreshing. Used this product to clean up some antique furniture that had been sitting in our grandparents'/parents' house for years. Needed alot of care. Product cleaned and restored a natural sheen to the wood, while moisturizing it. What could have been tossaways have become cherished, usable pieces in our home. Goes a long way. Highly recommend it, and you won't find a better price! I have a 3 year old, an infant and a cocker spaniel. Combining those three with stainless appliances and lots of woodwork makes for an impossible cleaning situation. Nose prints, hand prints, drool and all kinds of other crusty things are plastered throughout my home each day. I was desperate. I had tried dozens of cleaners and techniques and nothing would even clean sufficiently, let alone prevent further messes. In my desperation, I tried Bee's Wax Polish and was shocked. With a little elbow grease the first time, it cleaned everything. I used it on the stainless appliances, every bit of woodwork in the house, the mirrors and the sink and bath fixtures. Not only has it cleaned up and prevented the messes from the kids and the dog, it has even prevented the hard water stains from developing on my faucets. All with no greasy residue. This stuff is amazing. This Bee's Wax Polish is awesome! I was very impressed with it's cleaning power. What a great finish it left on my old dining table. It's the first thing I grab now when I have a cleaning project. My housekeeper was using spray furniture polish on my dining table, which had a plastic finish. If I tried to wipe it with a wet sponge it just turned to goop. She removed that polish and used this product instead--great shine and now I can wipe my table. Looks great on all my other furniture too. And it has a nice lemony smell. This is an awesome product. I especially like to use it on mirrors, as it cleans them nicely and without streaks. It lasts quite a while on wood and countertops, and helps to prevent fingerprints. I'll definitely be buying more of this. I love this product. 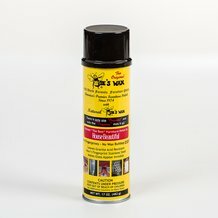 I've used it on all surfaces, not just wood. It leaves a shiny (not oily surface) that last long and actually makes wiping up later a breeze. Especially great on granite counter tops and stainless. Has a lite clean scent. Highly recommend this product.